CINCINNATI -- With the start of the new school year just a week away for Cincinnati Public Schools -- and other districts already back in session -- AAA is teaming up with Cincinnati police and neighborhood leaders to orient drivers back to safer habits. "This is a time where a lot of motorists have gotten lax in their traffic safety awareness because of the summer break," said Jenifer Moore, a local spokeswoman for the motor club. She's hoping she and others can get through to drivers to pay attention to the speed limit and other rules that will change during school hours. "Adhere to the speed limit. It is posted for a reason," she said. "Especially speed limits in school zones because they are modified." Red light turning restrictions often go into effect at school zone intersections during school hours, too, she said. And then there's the general unpredictability of kids. "Look out for children who might be excited to go back to school and just running across the street. Your awareness goggles need to always be on," Moore said. AAA's campaign comes as Cincinnati police have begun to allocate more resources to traffic enforcement, after nearly a decade of decline in traffic stops and citations . Over the last two years, neighborhood after neighborhood has lined up at City Hall, demanding action. Pleasant Ridge is one of those neighborhoods. CPD's traffic unit boosted enforcement on Montgomery Road for about 60 days last spring. At least four elementary schools serve as a big draw for families to move to the area, said Mackenzie Farmer Low. Low sits on the Pleasant Streets Traffic Committee, a subset of the Pleasant Ridge Community Council. Her neighborhood has been one of the city's most outspoken in lobbying City Hall to do more to protect residents walking and bicycling through their streets from speeding or otherwise dangerous drivers. Their requests are warranted. 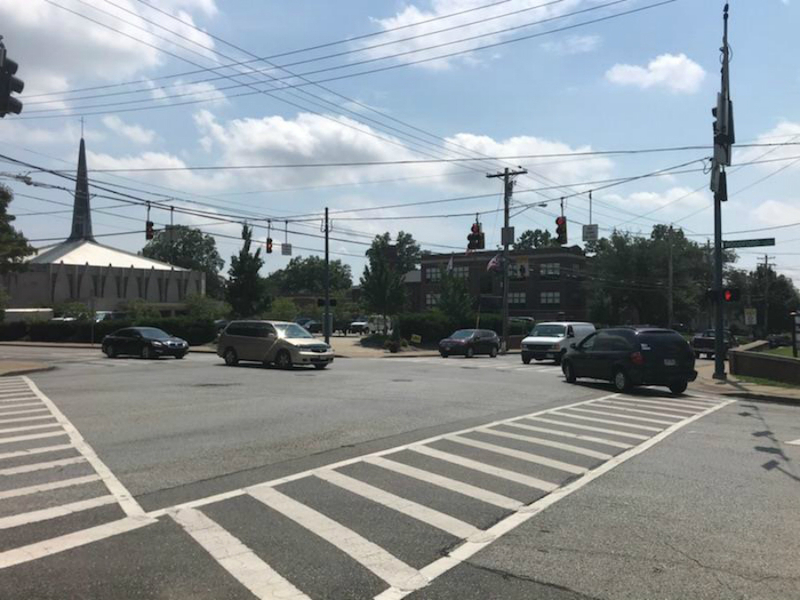 According to a Department of Transportation and Engineering online survey of city residents, Montgomery Road in Pleasant Ridge is a hot spot for speeding . There has been a recent surge in pedestrian-involved crashes, too. "We had one happen at Montgomery and Losantiville in the crosswalk, where someone was hit. Then we had an incident at Ridge and Woodford next to Nativity and TCP World Academy, and that was a 3-year-old in a wagon being pulled by a babysitter," Low told WCPO. That was just last month. Both incidents occurred less than a quarter-mile from three elementary schools -- Nativity School, TCP World Academy and Pleasant Ridge Montessori. Kennedy Heights Montessori isn't far away, either. It's an issue that extends beyond school hours, Low said. "I think you're just getting more pedestrians out all the time," she said. "They're walking to dinner. They're walking to the rec center. Pleasant Ridge is a thriving business district that has foot traffic all day long and into the night, too." Kids going to and from school every weekday throw another variable into the mix, Moore said. "A lot of children now have phones as well, and they may be walking, texting, playing their games or what-have-you, not realizing that there are a lot of things happening around them," she said. As part of raising awareness, residents can pick up a free yard sign at local AAA stores. Parents should be prepping their kids, too, Moore said. "Have the conversation with your children and your teens about safe driving and pedestrian behavior."